notes of jubilee: I Could Use A Little Musical Help Here (and a Giveaway)! I Could Use A Little Musical Help Here (and a Giveaway)! Whew. It's been forever since I've posted. With the weather so lovely (for the most part, it IS Ohio, after all) it's not as easy to sit and write without giving into the longing to be outside. And speaking of being outside, the chickadees and I are needing a change of outdoor scenery and going to take a mini road trip in the very near future. We have a dvd player, but no new dvds that will keep them entertained for very long. So, I am looking for some upbeat, family friendly tunage to get us through the trip. And then later I can use them to walk to for my daily (a-hem) workouts. Tunes that won't drive me crazy. It can be just about any genre - as long as it's kid friendly of course. Probably no Mettalica or Alice Cooper (although I hear he is saved now - anyone else hear that?!) I grew up listening only to contemporary Christian music so my secular music knowledge is extremely limited at best. The chickadees are kinda beyond the Laurie Berkner stage for those of you who are Nick Jr aficionados. And well, she's neat and all, but my musical tastes have moved on too. So far I have "I Don't Feel Like Dancing" by Groove Factory. Yep. That is the extent of my list. So sad. Needless to say, I am in need of some help, dear reader. I am hoping you can all pitch in and suggest a few songs that will have us singing along at the top of our lungs to help make the trip go faster. And my iPod is in great need of a musical library. 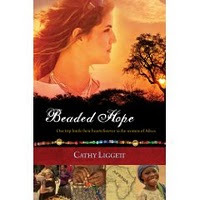 For your efforts, I am offering two books that I've reviewed recently: Beaded Hope and The Marriage Project. I'll draw two winners on Tues the 20th of April. All you have to do is leave a comment with your musical suggestion and let me know which book you prefer. You can have a separate entry for each song as long as you leave a separate comment for each. You only have to say your book preference once of course. This giveaway is open to U.S. residents. And please be sure to leave your email if your profile page doesn't link to your email or if you don't blog. So, upbeat family-friendly tunage = free books! **There's JUMP 5. Sung by kids for kids/families. **Ever thought about downloading the VBS music from last years VBS? KIDS remember AND you get a show watching them with the motions. I have 6 years worth on my iPod Touch. ** Veggie Tunes are timeless classics for the WHOLE family..
**Go to the library and lok for music, it's FREE!!!! You know me anything with books sign me up!! I picked up WOW 2010 music that has a bunch of different christian groups. Love it! Plus I'm now aware of some groups that I wasn't before. My kids have always like Newsboys. They have upbeat stuff and a good message. i guess i always go back to the great music/story by Path the Pirate. Did you listen to those when you were young? I still love them and they have great lessons for life. Try The Misterslippi River-my all time favorite. Go to Majesty Music to find them. I guess I don't have to tell you which book I would want. Considering. Just found your blog. Terrific! My suggestion: Josh Groban, the man and title of his first CD. Fantastic!